The US Special Forces were activated on 20 June 1952, and came to epitomize America's early efforts in South Vietnam. Recruiting from the former ranks of World War 2 special operations units such as 1st Special Service Force and the OSS, the new organization rapidly gained a reputation as one of the most effective, if unorthodox, formations in the US Army. Special Forces adopted the honours and lineage of the 1st Special Service Force and the Ranger battalions of World War 2, though it was not to become the Ranger strike force that this heritage implied. Instead Special Forces evolved into a force of highly motivated NCOs and officers thoroughly schooled in what was popularly called 'unconventional warfare'. This meant, in essence, the raising and advising of foreign regular and irregular armed forces. The first Special Forces (SF) unit to arrive in Vietnam was the 14th SF Operational Detachment, formed from personnel of the 77th Special Forces Group (Airborne). Since 1957 they had been training Vietnamese troops at the Commando Training Center at Nha Trang. Until 1961 the role of SF was to raise and train for the Army of the Republic of Vietnam (ARVN) its own special operations and unconventional warfare units. Teams from the 1st and 77th SFGAs served temporary tours in Vietnam for this purpose; the 77th was subsequently redesignated the 7th Special Forces Group (Airborne). This NCO wears a type of camouflage uniform favoured by SF personnel during this early stage of the war. 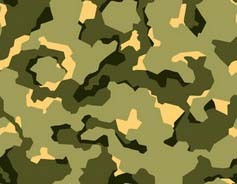 Generally referred to as the 'Beo-Gam' or 'leopard' pattern, it is thought to have been based on US World War 2 camouflage. CIA personnel operating in South-East Asia in the 1950s procured sets of commercial hunting clothing from US sporting goods outlets; consequently the pattern was sometimes given the generic name of 'duck-hunter'. Apart from these commercial imports, 'leopard' camouflage clothing could be purchased from a variety of sources. As the war outgrew CIA control the US government placed orders for camouflage uniforms with several South-East Asian countries under the Mutual Defense Assistance Program (MDAP). 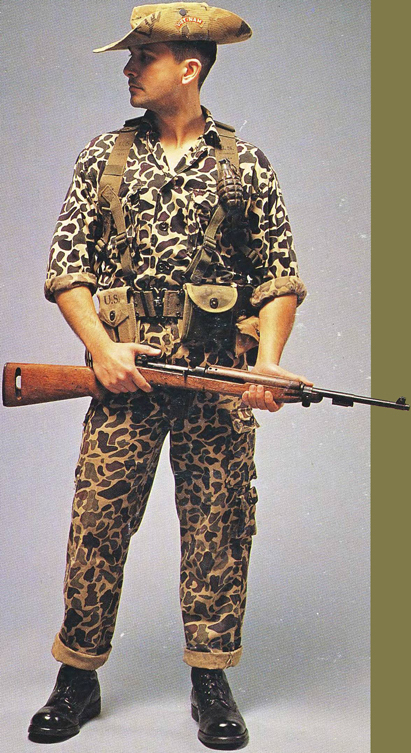 As with everything else, Vietnamese-made copies of these uniforms were soon available to US personnel. The items varied in colouration and style, the mis-matching of shirt and trousers, as here, being common. Headgear is a Vietnamese-made 'bush' or 'cowboy' style hat popular with all US advisory and training elements, including SF. These hats were manufactured in vast quantities and became synonymous with advisory duty in the early 1960s. There were many different styles and camouflage patterns, the example illustrated being fairly typical. Field gear at this time was largely a mixture of World War 2/Korean era items and the recently introduced M1956 web gear, depending on availability. Before the widespread issue of the M16 assault rifle a variety of personal weapons, from M3A1 sub-machine guns to Browning Automatic Rifles, was in evidence; even some former Wehrmacht MP40 machine pistols were used. The choice of weapon would dictate the type of web gear adopted. The semi-automatic Ml carbine, as here, was popular with both indigenous and SF personnel, as was the fully automatic M2 version.